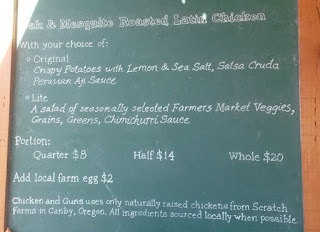 Chicken & Guns is located at the Cartopia food pod (SE 12th and Hawthorne) in Portland, Oregon. This cart opened in mid-June 2015. Throughout the spring, Cartopia underwent some major renovations and carts were moved around. While those changes were occurring, an imposing cart -- which would become Chicken & Guns -- started getting built on the east side of the lot. According to Eater PDX, the wood came from a 200-year-old barn. Dustin Knox (formerly of of Perierra Creperie and Central) and partner Todd Radcliffe opened the cart just in time for the summer rush. 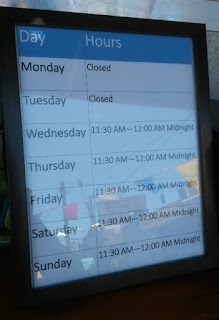 It's a very simple menu here. One chicken dish and choice of side (potatoes or salad). 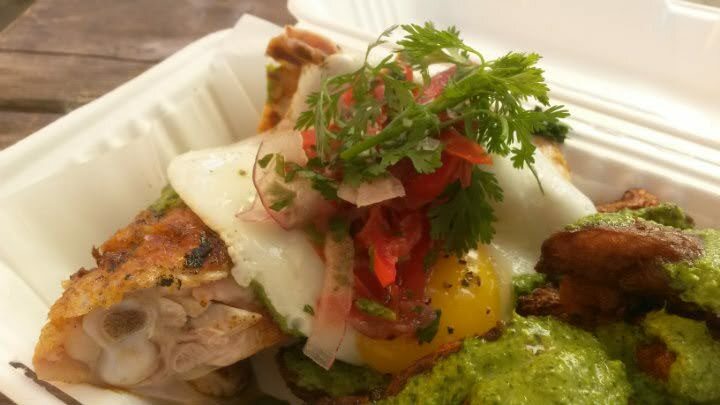 Everything is Latin-American inspired, and the ingredients are local. 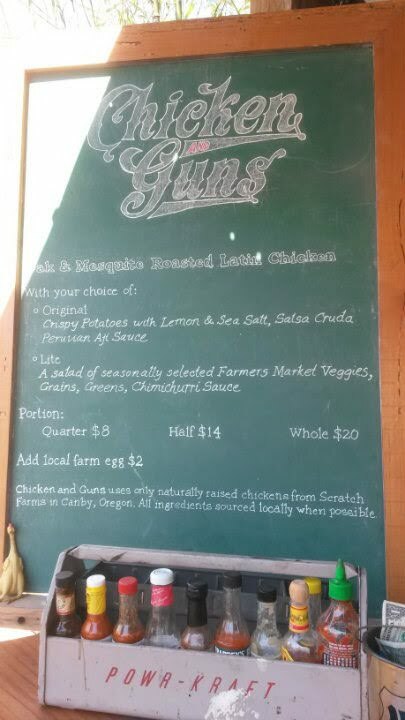 I'm happy to see food carts presenting simple menus. Focus on one dish and master it. 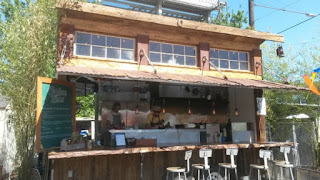 The chicken is grilled over oak and mesquite, and you'll get your choice of a quarter ($8), half ($14), or whole bird ($20). 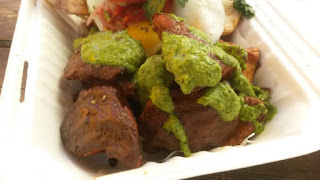 The sides include: (1) crispy potatoes with lemon and sea salt, salsa cruda, and Peruvian Aji sauce; or (2) a light salad of vegetables, grains, greens, and chimichurri sauce. You can also add an egg for $2 extra. I ordered the quarter chicken, crispy potatoes, and egg ($10). Dustin and Todd got their inspiration from their trips to South America and other Latin-American nations, and it is evident in their food. The chicken had excellent flavor, retained its juiciness, and possesses that wonderful grilled essence you cannot fake. I was likely better off tackling the two pieces of chicken with my hands, as opposed to attempting dainty, namby-pamby panda status with fork and knife. The crispy potatoes (cut into fairly large chunks) were simply incredible. The sea salt and lemon just liven everything up. Each had a lovely crispiness on the outside and a soft inside. The Aji sauce on top adds to the presentation and flavor. I could eat those potatoes all day. It reminded me of the amazing potato skewers I had at Yolk's Breakfast in Vancouver, BC (making me head back for other dishes the following year). 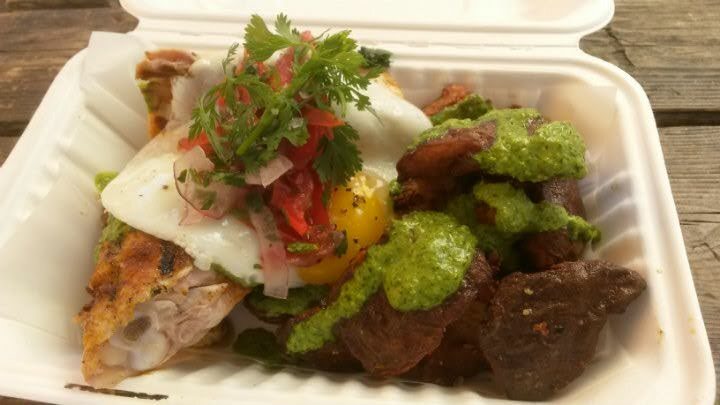 The egg is great for extra protein, and presents a more brunch-like option. At the end of the day, it truly is an add-on for me and is not required.